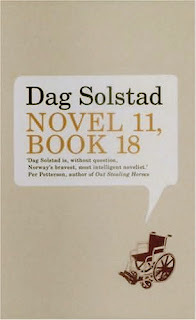 In planning this review of Dag Solstad's Novel 11, Book 18, I found two files containing notes from last summer for two more, both unwritten. The lists of ideas and quotations revealed wasted hours and renewed the hopeful pangs each had begun in me. I had believed the angels in Cees Nooteboom's Lost Paradise offer an unusual commentary on the strange call of fiction - something reviews routinely bypass or, at best, belittle. I wanted to pursue the call in this direction; reviewing is so much unnecessary repetition otherwise. Coetzee's long appreciation in the New York Review does not address the effect of the angels in this way but does cover more or less everything else I wanted to say, and the prospect of paraphrasing his plot summaries to reach the reserve from which the angels emerge was enough to discourage more effort. And then there was the diaphanous presence in Adam Thirlwell's Miss Herbert (AKA The Delighted States). The eponymous friend of Flaubert's is said to have translated Madame Bovary before anyone else, but the woman had died young and her work had disappeared. It leaves us, Thirlwell says, "a heavenly shimmer" of the perfect translation; something we'll never see. Again, there was a sense of something beyond reach, an unexpected residue. Thirlwell relishes the playful juxtaposition of contained narrative and surging life. Miss Herbert's absence is "not a story", he says, it is "real life", and leaves it at that. Indeed, his relaxed attitude toward the space between fiction and vanishing life is a constant throughout the surprising length of Miss Herbert. There is never any anxiety at fiction's inability to close the distance. In my imagined review, I had hoped to show how Thirlwell's brief comment burnt a black hole through the bright surface of postmodern literary mastery. By happy coincidence, Novel 11, Book 18 lightly satirises my earnest concern to stalk the unseen. It is itself about the gap between our hopes and ideas and the experience of life. The story concerns Bjorn Hansen, a Norwegian civil servant. His life is described from a distance, as if in a clinical report written in free indirect speech (hence perhaps the filing-cabinet formality of the title). For instance, his name is always "Bjorn Hansen", never just "Bjorn" or "Hansen". We're told he has left the mother of his two-year-old son to be with the wonderfully-named Turid Lammers. Why he has done this seems to be as unclear to the report as it is to Hansen. He drives to Turid Lammers' house in a town 45-miles from Oslo, moves in, and continues his life as if nothing had happened. We never hear from the abandoned wife and Turid Lammers never says a word. However, it is at the latter's suggestion that he applies for a local job. He even joins the local amateur dramatics society in which she is a star performer. They live together for many years. Everything is apparently stable. There are no snags. At least, nothing untoward appears in the report. This brief summary of the first half of the novel might seem inadequate but it is not much less than one gets reading Novel 11, Book 18. You might guess that there is something missing, and you'd be right. Something is missing for Bjorn Hansen too. The expected fullness of a meaningful existence with the love of his life has not materialised, at least not according to his expectations. The contingent banality of suburban affluence in a peaceful land is not enough. In a rare moment of reported speech, he tells a doctor that: "Nearly everything is totally indifferent to me. Time is passing, boredom is everlasting." "I find myself [here] by pure chance. [...] But if I hadn't been here, I would have been somewhere else and have led the same kind of life. However, I cannot reconcile myself to that. I get really upset when I think about it", Bjorn Hansen said, once more shaken in his innermost self by the fact that he was really expressing himself in this way in the presence of another person. "Existence has never answered my questions" he added. "Just imagine, to live an entire life ... without having found the path to where my deepest needs can be seen and heard!" The angst would be comic if it were indeed angst in itself. Instead, it is comical because it is emotion carried in the hunger for angst, for the reality afforded by the tag applied by public discourse rather than something unique to him, Bjorn Hansen. Hansen seems to have realised that he has cultivated experience in order to make life life-like according to the definitions of this discourse. Did he abandon his family merely because it was a decisive event? It seems so. When Turid Lammers flirts with fellow actors, he feels that he could go mad out of jealousy. Isn't this the real thing? Bjorn Hansen asks the same question and discovers the problem: "Had he not renounced everything in order to cultivate the temptation [of jealousy] in all its intensity, for what was left, after all, except this intensity?". Yes, this is the experience which might rent the fabric of life, but it has little or nothing to do with Turid Lammers and everything to do with Hansen's "profound yearning for something irrevocable". The second half of the novel follows Bjorn Hansen as he seeks the irrevocable with more focus. It's a quest in which we, as readers, have a share. Will this novel begin to provide the shapely conclusion we expect? Until now we have had a serious lack. For instance, after leaving Turid, Hansen is living alone in a flat when he receives a request. His grown-up son Peter, whom he hasn't seen in 14 years, asks if he can stay with his father while he takes a course at a local technical college. Hansen is thrilled by the idea. It sounds like another opportunity to discover real life. When the 20-year-old look-a-like stranger arrives, it is immediately clear that he is a peculiar and obsessive character. This gives a rougher texture to the novel. So what is the truth behind his strange behaviour and the decisions he makes that perplex his father? We never find out. Peter moves out with all the questions unresolved. This is the pattern throughout the book only this time it is felt more keenly. Bjorn himself moves on and continues with his plan to make real his idea of the irrevocable. Other novels might have led Bjorn into a crime ring or a murder mystery or have him discover some dark truth about his son. Instead Solstad gives him an at once upsetting and hilariously muted fate which changes nothing. It is encouraging that the reviews for Novel 11, Book 18 have been very positive. Eileen Battersby's in The Irish Times is worth a mention too. Perhaps more translations will be commissioned. However, to demonstrate what real literature is usually up against in mainstream reception, take a look at The Telegraph's review. Alan Marshall falls back on public labels such as "the existential novel" for this uncomfortable take on modern unhappiness. He complains that "Hansen's relationship with his son seems to open up another possibility for the novel, away from the rather stale, existential plotline" as if this were not about the meaning of possibility itself. "It's a strange failure of imagination," he says "posing as an act of imagination". It is strange precisely because Bjorn Hansen is seeking to make real his imagination; to make it fail as imagination. Failure is necessary to this unique novel. We leave Bjorn Hansen as he lives the dream, only now he wishes that someone could see him do so, to notice what he has done. The unseen continues to haunt the novel. Very pleased to read this, and also disquieted. I was planning to read Novel 11, Book 18 next, and now I wonder whether I really need to, as your review seems so complete (and beyond anything I will be able to rustle up in response to it). Of course the experience of literature is unique to each reader, so I will take it up anyway - though I might now wait until your review has faded a little, so as to maximise my chances of reading the book entirely on my own, if you see what I mean. "...to demonstrate what real literature is usually up against in mainstream reception..."
Or how about this? Searching for "dag solstad" on amazon.co.uk, I was given a list of results, headed by the helpful enquiry: "Did you mean dvd solstad?" BetaMax von Sydow - no relation to VHS Naipaul. If there was an unacceptable internet abbreviation LTN ("laughing through nose") I would use it around now in response to the above puns. Anyway I have now finished Novel 11, Book 18, an extraordinarily powerful read, and I return to this review to find, with some dismay, that you have summed up the book perfectly and even hijacked a couple of the extracts I wanted to quote in my own review. Perhaps I will just post a link to this one instead. I will be surprised if any of the other Independent Foreign Fiction Prize longlist titles I have here to read match up to it. I've already read Linn Ullmann's A Blessed Child and it doesn't. Still to come I have Celine Curiol's Voice Over and Juan Gabriel Vasquez's The Informers. Oh, I forgot Sjón's The Blue Fox which was very good, but in the way of books read more than two weeks ago, is already fading from memory. Thanks John. You should carry on with your review regardless. I've forgotten my review already. And Asylum will bring it to a wider audience too. I'll be interested to know what you make of the Vasquez. It deserves more attention along with Mr Solstad. This looks very interesting. Maybe I'll get round to it one day. I love the title. Is there any deep relevance there, or is it just the most uninformative title for a book ever?